One feature that most visitors to the Greeny Flat notice and comment on is our picture rail that doubles as a conduit for the electrical wiring in the house. For many years now I’ve been wanting to experiment with a surface-mounted electrical system rather than burying all the wiring inside the walls. I’ve always thought that it could make a functional and interesting feature and in the Greeny Flat I’ve finally had the chance to try it out. I have to say that we’re delighted with the results. The main reason to surface-mount the electrical system is so that it is easily accessible for future changes and upgrades. This is particularly important in a house like the Greeny Flat which has a cathedral ceiling and a concrete slab floor. Because we have no attic space and no crawl space under the floor it would be extremely difficult to make changes in the future if all of the wiring was hidden inside the walls. 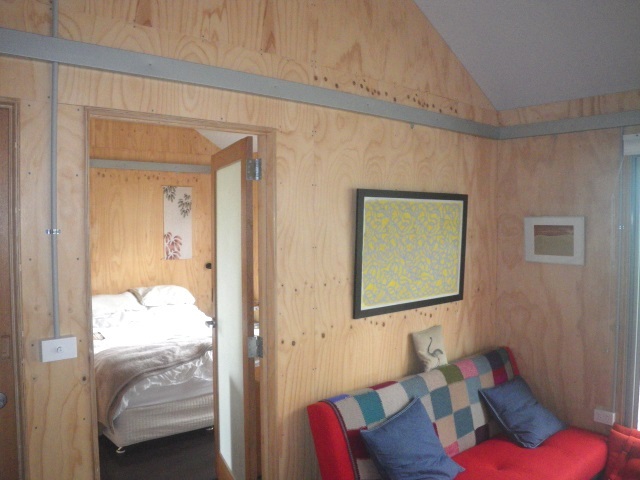 As it turns out, in our case we would have had the option to unscrew some of the plywood wall paneling to get to the wiring, but in most houses it would require tearing into the gyprock walls. This would entail a lot of repair work, dust and disruption. By surface-mounting the wiring in a conduit we’ve made it very easy to move a switch or add a powerpoint as needed at any time in the future. Even a complete rewiring of the house would be a relatively simple job when the wiring is so easily accessible. I’ve always thought it was silly to hide all the plumbing and wiring inside walls where you can’t get to it. In commercial buildings it is quite common to run the services either on the surface or inside conduits that are readily accessible. This is because, in commercial buildings, it is often necessary to make changes as technology improves or the needs of the occupants change. So why not do the same in homes? For years now I’ve been looking for a ready-made system that could easily be adapted for use in homes but I’ve yet to find the right one. 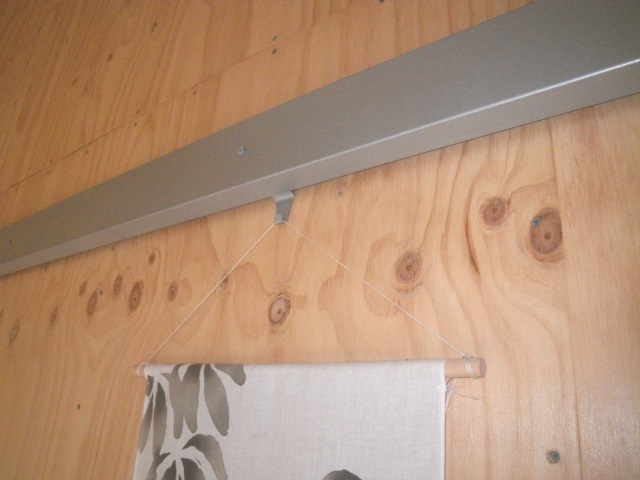 So for the Greeny Flat we had to invent our own which we based on a very old idea… the picture rail. Why use a picture rail? A good old-fashioned picture rail. 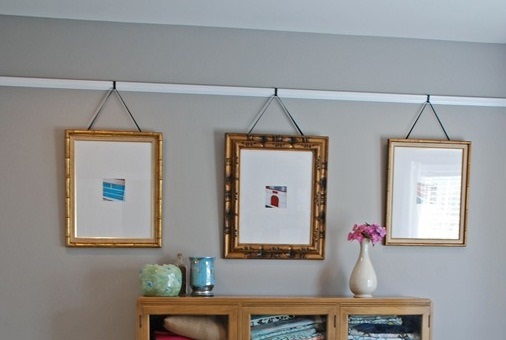 If a picture rail seems like a quaint and old-fashioned idea, that’s because it is. In fact almost all old houses built before about 1950 had picture rails in every room. The purpose was obviously to allow the occupants to hang pictures and mirrors wherever they wanted to without making holes in the walls… a pretty good idea really! The rail was also often used as a dividing line between paint colours (although not in the photo above). 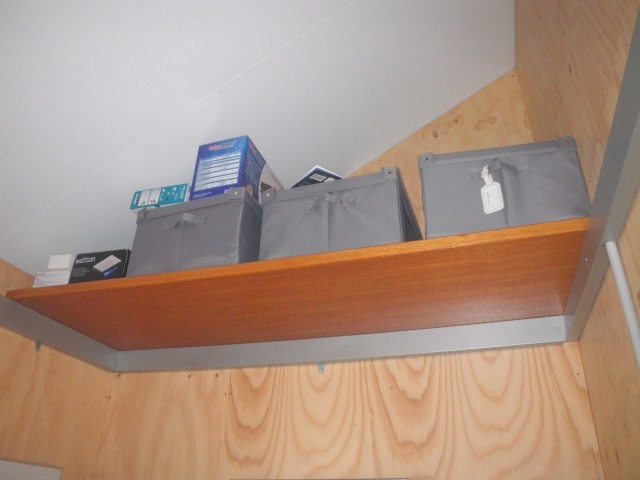 I’ve lived in many houses in both Australia and the US that had picture rails and I really like their practical functionality. You can still go down to any hardware store and buy the hooks that fit over the rail and the wires for hanging pictures. For the surface-mounted electrical system in the Greeny Flat the picture rail has another significant advantage in that it allows the electrical conduit to go all the way around each room above the height of the windows and doors. I have heard about commercially available systems where the wiring is hidden in the skirting boards at the base of the wall but what do you do when you get to a doorway? You’d have to take the wires up and over the door and back down to the skirting board on the other side of the doorway. With a picture rail we don’t have that problem so the whole system is much simpler. I’ll go into more detail about how we built the conduits below but, first, here are some photos that show different ways that we’ve found to use the rails. In these photos you can also see how we were able to run wires in round conduits down to switches and powerpoints or up to lights. Picture rail used to hang a Japanese fabric painting. 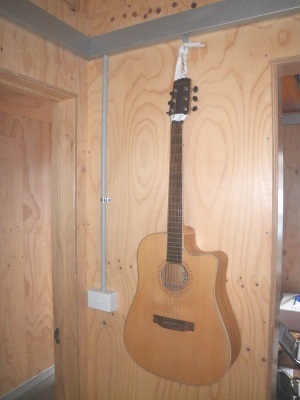 Picture rail used to hang a guitar. Picture rail used as a ledge on which to sit a shelf made out of an old hollow-core door in our study. As you can see, there are many ways that we’ve found the picture rail to be a useful and practical addition to our home. Aesthetically we also find that it adds an element of interest as well as a visual break in the plywood walls, some of which are four meters high and might have been a bit overpowering without the clean line of the metal conduit to divide them. And, because the rail runs around all of the rooms except the bathroom, it provides a unifying element to the various spaces and between indoors and outdoors (where zinc coated steel is the predominant material). Detail showing the construction of the main conduit. As mentioned above, I have searched for an off-the-shelf product that would do what we wanted but so-far haven’t found what I’m looking for. So for the Greeny Flat we made it ourselves. The main conduit is made in two parts (see photo above). 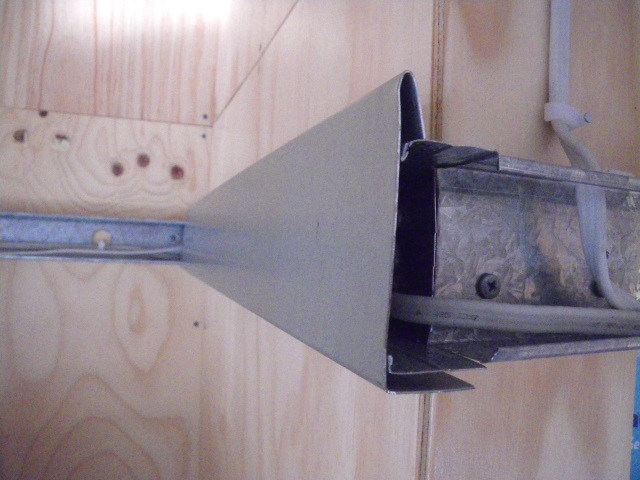 The first is a galvanised steel c-section that is commonly used for studs in steel-framed walls. This was relatively cheap and easy to get and is made of pretty thin steel (from memory it is 0.55mm BMT) which makes it easy to cut and drill as needed. It would have been nice to be able to simply use a second c-section that was slightly bigger as the cover piece to go on the face but, unfortunately I couldn’t find the right material. Most of the stud sections that are available off-the-shelf have holes drilled in them at regular intervals which was fine for the backing piece but wasn’t going to work for the face. We also wanted the finer look of the zincalume coating rather than galvanised and this wasn’t available off-the-shelf. Finally, we wanted to create a lip on the top edge of the conduit which would allow us to hang heavier things or to hide indirect lighting in the form of an LED rope light. So for all the above reasons we ended up having the face pieces specially bent up for us out of a slightly heavier zincalume coated steel. (We ended up using a 0.70mm BMT flashing material rather than the standard 0.55mm because we found that the lighter section wasn’t able to support the weight of our largest and heaviest pictures). Once the backing section was in place we simply had to drill holes where required and install round plastic conduit down to each of the switch and powerpoint locations or up to lights and ceilings fans. Once all of the conduits were in place we ran the wires and, because the conduit is metal, we had to ground each section of the main conduit. Then we cut notches out of the face piece in order for it to fit around the vertical conduits (see photo below). For the picture hooks themselves we cut pieces out of the offcuts of the face flashing and bent them into the shape shown below. 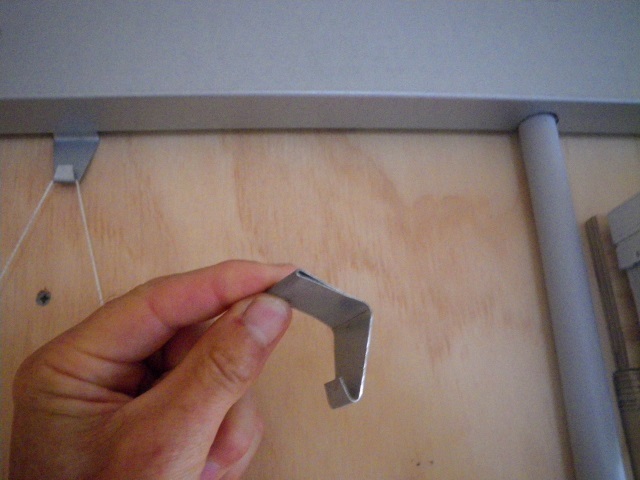 Picture hook made out of zincalume coated steel section. These hooks are inserted at the corners of the conduit (see photo below) and simply slid along until they are in the right spot. And that’s about all there is to it. We’re very happy with how the system looks and functions and when it comes time to make any changes to our electrical system we’re going to be so happy that we chose to surface mount everything where it’s easily accessible. 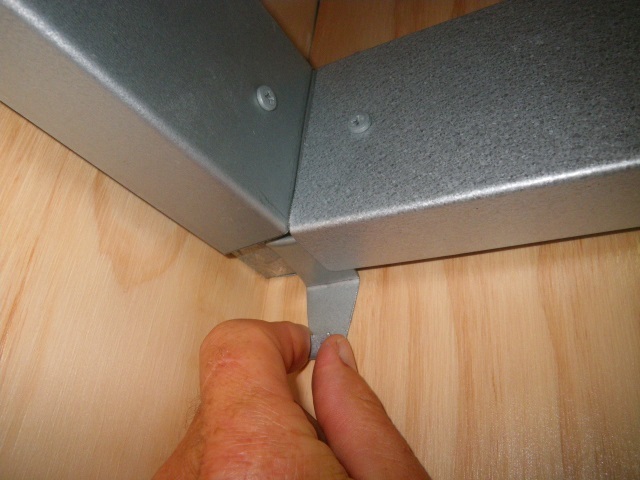 The picture hooks are simply inserted at the corner and slid into place. Next week I plan to write about the confusing and complicated issue of switching to Green Power. Great to see pictures of it in action! Thank! I like the idea. One suggestion is you could have used C section studs (as you have) then used U shape Plate for the cover. This slips over the C stud. You might even be able to get the U rolled from Colorbond to save painting. (Many Frame suppliers roll their own studs/plates. They can run them with no holes if required). Of course, your solution is more elegant, but folded shapes are expensive. One tip is to try to make the sections the same size as stock material, otherwise you pay for the extra waste! Thanks Doug, as you noted we used stock material for the chase but we needed the cover to perform as a picture rail and a u-shaped section would not have worked for that. Hence the folded shape in zincalume to avoid painting.